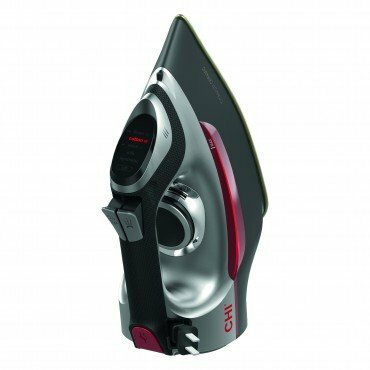 The Electronic Clothing Iron is durable enough to withstand scratches, heats up quickly and provides an extra-smooth glide. Ironing is simpler than ever with an illuminated, digital temperature control, adjustable steam and an easy to grasp, comfortable handle. The electronic temperature control doubles as the water tank access door and swivels open for easy filling. With over 400 steam holes, you can smooth out the toughest of wrinkles effortlessly. The 8' cord is retractable for neat storage. Features: CHI flat iron technology, titanium-infused ceramic soleplate, 10' cord, and a limited 2 year warranty.